The “ACE Summer” of 2013 is in full swing as the University of Notre Dame’s Alliance for Catholic Education (ACE) once again hosts more than 300 participants in programs preparing tomorrow’s leaders of Catholic schools. Intensive coursework and vibrant opportunities for community life and spiritual growth are enriching many recent college graduates from around the country who have come to campus for Service Through Teaching, ACE’s distinctive formation of Catholic school teachers. That initiative is now starting its 20th year of operation. In a related ACE program, more experienced teachers are taking courses to become Catholic school principals and sharing experiences that embody the same values in education, community and spirituality. Other Catholic school teachers are receiving focused preparation in “English as a New Language” or “Teaching Exceptional Children” skills that will help make their classrooms more inclusive for students. These varied participants, living on campus during all or part of the June-July peak season, are invited regularly to come together for Mass and meals, as well as other forms of prayer and fellowship. The season builds toward two annual highlights — the ACE Commencement ceremonies, set this year for Saturday (July 13), and the ACE Missioning ceremonies, on July 25 and 26 (Thursday and Friday), when the educators are sent forth to numerous partnership sites, often tasked to serve disadvantaged children in under-resourced schools. This summer’s keynote speaker at the ACE Commencement exercises will be U.S. Sen. Joe Donnelly of Indiana, who is a Notre Dame graduate. Among the participants in the ACE Service through Teaching formation program, 85 graduates are expected to receive master of education degrees from Notre Dame at the commencement. The University also expects to confer 26 master of arts degrees in educational administration to graduates of the curriculum preparing Catholic school teachers, namely ACE’s Mary Ann Remick Leadership Program. Special awards will go to ACE graduates who have continued in education careers and are making big contributions through their service to Catholic schools. The Missioning ceremonies will culminate in a Mass on July 26 (Friday) in Notre Dame’s Basilica of the Sacred Heart, with Archbishop Joseph W. Tobin of the Archdiocese of Indianapolis as the invited presider. The Archbishop will join ACE founder Rev. Timothy Scully, C.S.C., in sending forth 173 participants in ACE Service through Teaching and 48 participants in the Remick Leadership Program to spend the regular 2013-2014 school year serving in Catholic schools around the country even as they continue in their two-year curricula and other formation. Teachers enrolled in the Teaching Exceptional Children and English as a New Language initiatives, which are one-year programs leading to licensure and eligibility for certification, also will end their portions of the ACE summer by going back to the schools where they customarily serve and resuming their coursework online. Enrollments in the 2013-2014 initiatives to serve children with mild to moderate disabilities and young English-language learners have expanded. Some 24 educators are starting their Teaching Exceptional Children studies this summer (up 85 percent from last year), and the ENL program is welcoming 42 participants (up about 130 percent), including teachers from Puerto Rico and Chile. ACE Summers include a variety of activities beyond the strictly academic, such as retreat opportunities for the formation program participants and a number of conferences on key topics in Catholic education, attracting to campus diverse groups of leaders who serve children and share ACE’s mission of sustaining, strengthening and transforming Catholic schools. The summer is reliably a busy time of ongoing programs and new initiatives for all members of the ACE community. Aspiring teachers in the “ACE 20” cohort, which comprises the 90 newest participants in the ACE Service through Teaching program, may be especially aware that the “20” moniker foretells a 20th anniversary celebration set to begin soon. ACE has said it plans to mark the anniversary — of its founding in 1993 and the missioning of its first cohort of teachers in 1994 — with a celebration of Catholic schools that will span the 2013-2014 academic year. 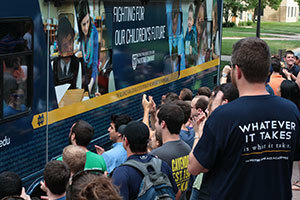 Notre Dame’s Fighting for Our Children’s Future National Bus Tour will launch in October, with plans to visit Catholic schools, along with their communities of supporters and ACE partners, in more than 40 cities nationwide. Originally published by William Schmitt at news.nd.edu on July 08, 2013.